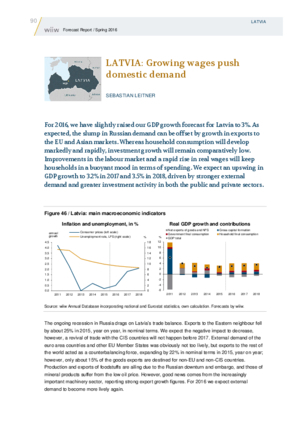 For 2016, we have slightly raised our GDP growth forecast for Latvia to 3%. As expected, the slump in Russian demand can be offset by growth in exports to the EU and Asian markets. Whereas household consumption will develop markedly and rapidly, investment growth will remain comparatively low. Improvements in the labour market and a rapid rise in real wages will keep households in a buoyant mood in terms of spending. We expect an upswing in GDP growth to 3.2% in 2017 and 3.5% in 2018, driven by stronger external demand and greater investment activity in both the public and private sectors.